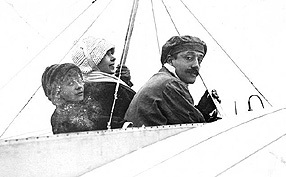 Aviation pioneer Jacques de Lesseps, or the Comte de Lesseps, as he is often known, was the eldest son of Ferdinand de Lesseps, the French diplomat who was behind the Suez Canal. One of the premier architectural landmarks along the south Gaspe Coast (Route 132) is the remarkable LeGrand Hotel in Port Daniel. Built in 1899 by Alfred Dumaresq LeGrand, a native of Jersey, the building is as fine an example of Second Empire architecture as one is likely to find in this part of the world. Tears roll down Carl Bond's cheeks as he stands outside the 96-year-old general store overlooking the glittering bay where Perce Rock looms in the distance. The door is locked, and, for the first time in 38 years, store manager Bond no longer has the key. "It's a whole lifetime all gone down to nothing," says Bond, 55, who started working here at age 16. The Robin store - owned by Robin, Jones and Whitman, Canada's oldest retailer after the Hudson's Bay Co. - was where villagers bought everything from sugar to septic tanks, cashed their cheques and gathered for gossip. We grew up right here in York. Oh yes, there was a number of us boys grew up here together. The Stewart boys and the Jones boys. As young fellows in the summertime, we spent a lot of our time in the water, down there on the shores of York River. York Bay you might call it. Swimming and wading and playing down on the beach. Then we used to do work with our mother and father-sometimes a little in the garden, haymaking would come up and milking and stable work. Hunting and fishing too, every boy did that. The publication of our book, Our Gaspé Home, Now and Forever, created a whirlwind of excitement in our halls and classrooms. It was not, however, our only triumph. My father was a lighthouse keeper from 1925 to 1940. We all had chores as children and it was my responsibility to keep the globe on the lighthouse lantern clean so that the boats could see the light coming in to the harbour and not go aground. Every morning I would go down to the lighthouse with my dad. We may not have had much as kids growing up in Douglastown, but the one thing we did have was a lot of fun. We used to play cards and board games, but the highlight of our days was going to the post office.We kids always used to hang out at the post office.I will never forget Mr. Kennedy, the postmaster we had for years and years.He was as nasty as anything; mad as a rooster. We would go all over the place on the bikes. My fondest memories of living on Bonaventure Island are the beautiful beaches. Bonaventure Island has some of the most beautiful beaches I have ever seen. I remember when I was a child I was told to stay away from the cliffs, as they were very, very steep and my aunt and uncle were afraid that I might fall off or that something terrible might happen to me. They were very protective of me. I was just a young fellow of ten years of age when I remember my mother saying that it was time for me to accompany my father in the woods trappin’. She did not like the fact that he would be two weeks alone out in the woods without anyone around to look out for him. The woods can be a dangerous place for a fella on his own. If anything ever happened back there in the woods, he would be in bad shape! My daddy would go 50 miles back into the woods – that’s right-50 miles on foot into the woods. So after I had done about three years of school, I quit and headed into the woods with my daddy. Our home was the gathering place in the community. We were one of the first ones in Little Pabos to have a radio. I remember when the Lone Ranger would come on. My grandfather, who was in his eighties at the time, would come and find us to let us know that the program would be on shortly.